A man who caused £50,000 worth of damage after setting fire to a Red Cross emergency vehicle escaped a jail sentence yesterday. Josh Metcalfe, 20, of Telford Street, Inverness, had previously admitted a charge of wilful and reckless conduct at Cradlehall Business Park on September 13, 2016. The city sheriff court heard that the blaze in the cab took hold and destroyed much of the lorry and its medical supplies. Police and the Scottish Fire and Rescue Service attended at Smithton Primary School when they had reports of smoke being seen in the area. A cigarette bin was found ripped off a wall and smouldering with bits of cardboard. 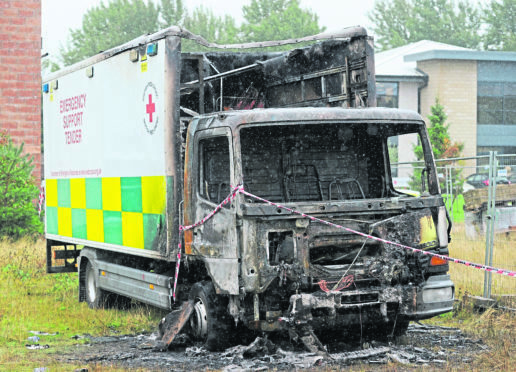 Forty minutes later police then received a report of the Red Cross Mercedes 7.5-tonne lorry on fire at the business park. Police and firefighters attended. The lorry, which was used to provide aid at major incidents and events, was ablaze. The fire service extinguished the flames. Metcalfe was seen on CCTV to walk away from the area about 15 minutes beforehand. He had also admitted causing malicious damage at the school and breaking into the lorry with intent to steal. Sheriff Eilidh Macdonald said she would be entitled to impose a jail sentence, but added that defence lawyer David Patterson had persuaded her to impose the alternative. Metcalfe was ordered to remain under social work supervision for 18 months and instructed to carry out 220 hours of unpaid community work. Mr Patterson said that his client was 18 at the time, had “gone off the rails and was consuming drugs”. The solicitor added that Metcalfe had been diagnosed with ADHD at four years of age and then with autism at 14. Mr Patterson told the sheriff that his client had set a fire beside the vehicle in an attempt to cover up his previous crime at the school. He went on to say that fire officers said that it would not have taken much for the vehicle battery to ignite, and that is how it went on fire.